You can enter the Dakota jazz club from the street or the skyway that connects the office building it’s in with the parking ramp across the way. Often, if we can’t find street parking, HH drops me at the door and goes off to work his secret parking juju. That’s how I came across trumpeter Roy Hargrove between sets, standing outside the revolving doors and smoking a cigarette. “It is?” I ask. This is a January night and bitterly cold. Hargrove has come here often enough that he knows how to dress—felt-lined Sorrels on his feet, a big fur hat with earflaps perched crookedly on his head. “Well, I’m glad to hear it.” Lame, but the best I can do. Wearing neither Sorrels nor earflaps, I go inside where it’s warm and wait for the music to start. 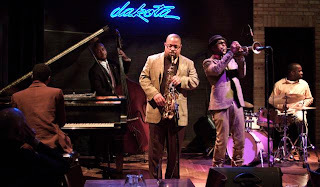 It’s the second night of Hargrove’s two-night engagement at the Dakota, on the heels of two weeks at Yoshi’s San Francisco, the first with Pharoah Sanders, the second with his progressive jazz group RH Factor, and every night (his manager said) sold out. A residency, like the old days. What a thrill it must be, if you can afford it, to hear a great artist play so many nights in a row. We were here last night as well, second set, hearing the latest incarnation of Hargrove’s quintet. Still with him, sharing the spotlight and the front line, Justin Robinson on saxophone. Same drummer as before: Montez Coleman. A new bass player (previously Danton Boller or Dwayne Burno): Ameen Saleem. 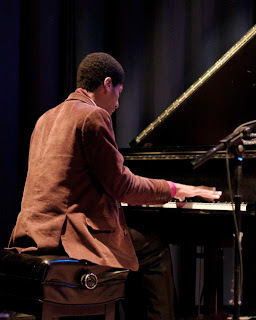 A new pianist (previously Sullivan Fortner or Gerald Clayton, either of whom I’d see again in a heartbeat): Jonathan Batiste. 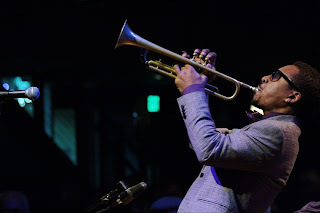 We saw Batiste briefly at last year’s Monterey Jazz Festival. I remember thinking—hello, where did you come from? Tall, bony, rail-thin, with fingers as long as E.T.’s, he already makes my head spin and he’s only 23. For his Dakota dates, he wears a sparkly scarf. Hargrove rarely tells you what he’s about to play or just played, so all you can do is go with the flow. The first night begins with “Society Red” and ends with “Bring It on Home to Me.” In between, bop and ballads and swing. During the encore, the band members exit the stage one by one until Saleem stands alone, his bass the last thing we hear. The second night is the most memorable for me, probably because it includes more ballads. Not that I don’t enjoy the quintet on fire, horns wailing, drums pounding, Hargrove's slight body bent like a bow—I do. I watch them play, their seamless interaction, tightness and looseness, seriousness and playfulness, and wonder—does it get any better? Can it possibly get any better? But Hargrove’s ballads are extraordinary. So beautiful. Full of emotion, wisdom and ruefulness. The one that kills me tonight: “Speak Low.” (“Love is a spark, lost in the dark too soon, too soon…. The curtain descends, everything ends too soon, too soon….”) For ballads, Hargrove often switches to flugelhorn, the trumpet’s buttery cousin. It’s flugelhorn on “Speak Low,” which concludes with a lacy solo by Batiste that he turns into a joke, quoting TV themes. Amusing but jarring and a reminder that he’s only 23. Note to Jonathan: Don’t. Break. The. Mood. "Speak Low" is followed by another ballad Hargrove introduces by saying “Here’s a pretty song, like an open meadow with daffodils.” I think he says “Equipoise”? (Roy Haynes?) And a third ballad: “The Serenity of Solitude,” something Hargrove wrote recently, another gorgeous tune that begins with Coleman’s mallets on the drums. We’re all soft and mushy when the quintet shifts into something fast and hot. Back to bopland. Then Hargrove calls vocalist Debbie Duncan to the stage, as he's done on previous visits. You can tell Saleem and Batiste haven’t heard her before because their jaws drop when she starts to sing “Bring It on Home to Me.” She’s jazz and soul, gospel and R&B, a belter and a scatter who can also purr. Actually, she can sing anything. In February, she’ll return to the Dakota stage with a new band, put together by Anthony Cox and featuring his Regional Jazz Quartet. Can’t wait. Hargrove closes with something else sweet, they leave Saleem alone on stage (same as last night), the crowd calls them back and Duncan joins them to sing “The blues ain’t nothin’ but a woman gone bad.” Montez takes a solo, this should be the end, but they keep playing until they’re ready to quit. Note: Reader John Scherrer tells me that "Equipoise" was written by Stanley Cowell, not Roy Haynes. And that it was Hargrove who started quoting TV themes, letting Batiste slightly off the hook. Shared your words with Roy...loved it! Will print off and give Ms. Debbie Duncan a copy as well. Jonathan Batiste was inspiring. I was there that night. Whoever wrote this obviously doesn't have a clue. Batiste plays well beyond his years. I think Batiste is an amazing pianist. Not sure what you're objecting to--that I didn't love it when he turned a ballad into a joke? Well, I didn't, but I'd go to hear him play anytime.